12/01/1978 0925 Squaring The Triangle After unwittingly spending time with the wife of one of his employees when he is stranded in a remote airport due to a snowstorm, he falls for her. Praying for his death, the CEO sends her husband on a dangerous assignment. 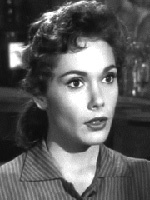 She starred in two episodes (887, 925) In both she played a wife having an affair. Both episodes were interesting twists on that scenario. Felicia Farr (born October 4, 1932) is an American actress and model. Born Olive Dines, Felicia Farr appeared in several modeling photo shoots and advertisements during the 1950s and 1960s. Her earliest screen appearances date from the mid-1950s and included the Westerns Jubal (1956) and 3:10 to Yuma (1957), both starring Glenn Ford and The Last Wagon (1956) starring Richard Widmark. Farr's later films include the bawdy Billy Wilder farce Kiss Me, Stupid (1964) with Dean Martin and Ray Walston as her husband, ; the Don Siegel bank-heist caper Charley Varrick (1973) with Matthau; plus more than 30 television series appearances on The Alfred Hitchcock Hour, Bonanza, Ben Casey, Burke's Law, and many others.